ME3 Rajeswary is an expert in all things related to air operations. 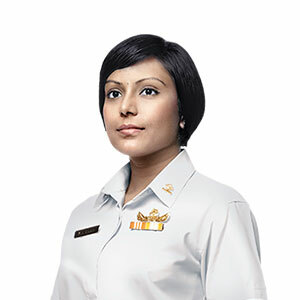 From state-of-the-art surveillance sensors, networks, communications, to computer systems, she enables the Air Force to see, hear, and recognise every threat – even before they enter Singapore's airspace. I've been in the Air Force for 16 years, and the journey has been extremely fulfilling. It has given me the chance to travel all over the world, from Darwin and Rockhampton in Australia; Alaska and Nevada in the USA; to Cold Lake in Canada. These experiences have been truly memorable – and certainly something that you cannot find anywhere else in the corporate world. Do you think women can excel in the RSAF? Of course. Women are given equal opportunities to shine, and sometimes they do even better than their male counterparts. I've seen women in my squadron take up key roles, such as Squadron Command Chief, Officer Commanding, Flight Warrant Officer and Base Coordinator. They prove that if you are capable enough, you can lead and succeed. What type of unique skills do you think women bring to the RSAF? Some vocations in the RSAF, such as the AOSX, are not physically strenuous. When strength is not a factor, I think women may have a competitive advantage. Most of us are very detailed and meticulous. So it's natural that when we're given a task, we always demand high standards and give it our very best.